« Best Buy Isn’t Evil? TiVo recently announced the discontinuation of their TiVo Rewards program. I had amassed 10,000 of these mystical TiVo Rewards points while participating in some odd rituals that I do not understand and cannot adequately explain. Clearly, I had some spending to do. 10,000 feels like a large enough number, and with the diminishing dollar (USD) it must surely be a small fortune or two! Alas. 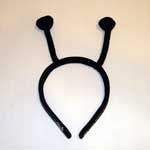 I had a choice between several cheesy trinkets (TiVo Antenna Headbands! 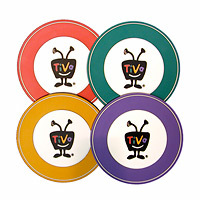 TiVo Coasters! TiVo Plush Dolls! TiVo Hooded Baby Bath Towel and Wash Mitten!) and exactly one iPod Shuffle (1 GB). While I like cheesy trinkets as much as the next guy who poses an Orc on his stove, the flammability of the TiVo Plush Dolls was almost certain. I had to go with the Shuffle. 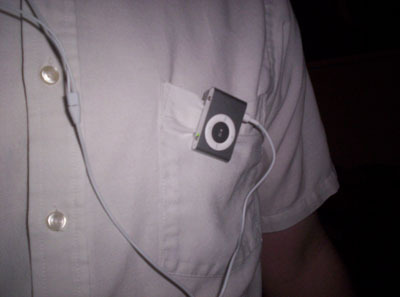 I had no intentions of using the iPod Shuffle, you see. I’ve owned a 30 GB Zune for about seven months now, and I haven’t been unhappy with it. Sure, it really is a little white brick, but its a cute little white brick that plays hours of music and video. Shortly after vowing to save it for a forgotten birthday or impromptu Christmas gift, I opened the package and loaded on some Guano Apes and Flyleaf. I started listening to it ‘for fun’. I brought it into work. I used it in the kitchen. And I would use it in a boat. And I would use it with a goat… And I will use it in the rain. And in the dark. And on a train. And in a car. And in a tree. It is so good, so good, you see! I haven’t used my Zune since. How is this possible? How can a small and stupid iPod without a screen compete with a Zune that stores every song in my collection? I’m not entirely sure. Pro: The Shuffle is small. Really small. Tiny, even. Before I tried the Shuffle, I truly didn’t mind that my Zune was a brick. I just sat it on my desk at work, and I just accepted that my headphones would occasionally disconnect when the cord got hooked on my chair. The Shuffle stays clipped to my clothing, so the cord doesn’t hook on anything. Con: I tend to lean against walls and desks, which has increased the Shuffle volume to deafening levels. I should really learn how to use the Hold function. 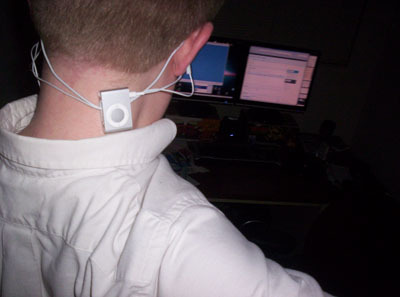 Pro: I’m not tied to my desk with the Shuffle, I can just get up and walk away while listening to music. With the Zune I had to take off my headphones, which takes just a little more effort. Con: I look like an iPod douche bag while walking around work with white ear buds firmly in place. Con: I don’t like Star Trek. That much. Pro: The Shuffle is small enough you can wrap the cord around your ears and clip it behind your head. Con: The Shuffle will blink Green and Orange in obtuse combinations to notify you of its state. I thought you were good when it came to user interfaces, Apple? Con: There seems to be a significant static hum if the Shuffle volume is very low. Con: It is not possible to listen to the Shuffle and charge it at the same time, because the headphone jack is also the power port. Conclusion: I am truly surprised and impressed by the iPod Shuffle. I can’t say that it is worth $50 (USD) to everyone, but I can heartily recommend it if you have 10,000 TiVo Rewards Points burning a firewall in your hard drive. This entry was posted on Wednesday, April 2nd, 2008 at 11:13 pm	and is filed under Impression, Tech. You can follow any responses to this entry through the RSS 2.0 feed. Both comments and pings are currently closed. With a goat, eh? Heh.